Refunds for change of mind purchases are costly for us and we regret that we cannot offer any returns for this reason. Please choose your product carefully by reading the product description thoroughly and / or contacting us to find out more about the product. the product doesn’t match the sample or our description. Before refunding some items Mobile Safety may occasionally first elect to return the product to the manufacturer to determine the nature of the problem. If the product is determined to be faulty, not fit for purpose or not matching a description or sample Mobile Safety will offer a repair, exchange voucher or refund. Please make an application for refund within 7 days of recognition of the fault. Please note you will need to present a copy of the tax invoice you received by email to claim a refund. Request that a customer demonstrate that any problem with goods supplied was not their fault. We ship Australia wide or international. Please contact us for a special postage quote on high volume orders). We recommend registered post signature services for higher value orders. Special shipping arrangements are also available if offered in the shipping section of your purchase process eg Express post, receipted deliveries, couriers, international destinations etc are available as offered or contact us for your specific requirement. We ship Australia wide or international as indicated above but subject to readily available postal services and OFAC regulations. Contact us for more information. We ask you to ensure that your country has no legal restrictions on the import of our product in your country. Orders placed before 2 pm (Aust. east coast time) will generally dispatch the same day or else be sent the following day. This is our usual practice but no absolute guarantee is given. We guarantee despatch within 48 hours but for circumstances that are irregular to our usual operation eg natural disasters, stock shortages etc. Australia wide deliveries are sent parcel post unless expediated services are ordered. The list of available delivery service alternatives is listed on our website. Goods lost in transit (that our freight supplier is unable to verify delivery of) are insured to the value of $100. Extra insurance available on application. Your privacy is important to Mobile Safety. This privacy statement provides information about the personal information that Mobile Safety collects, and the ways in which Mobile Safety uses that personal information. 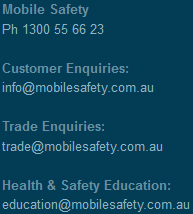 any other information that you send to Mobile Safety. send you communications & updates. Where Mobile Safety necessarily must disclose your personal information to its agents or sub-contractors for these purposes, the agent or sub-contractor in question will be obligated to use that personal information in accordance with the terms of this privacy statement. In addition to the disclosures reasonably necessary for the purposes identified elsewhere above, Mobile Safety may disclose your personal information to the extent that it is required to do so by law, in connection with any legal proceedings or prospective legal proceedings, and in order to establish, exercise or defend its legal rights. Mobile Safety will take reasonable technical and organisational precautions to prevent the loss, misuse or alteration of your personal information. Mobile Safety will store all the personal information you provide on its secure database. Information relating to electronic transactions entered into via this website will be protected by encryption technology. This website contains links to other websites. Mobile Safety cannot be held responsible for the privacy policies or practices of any third party. Returns, shipping and privacy policies are outlined above. See also remaining terms and conditions.